The jutti (Punjabi: ਜੁੱਤੀ) or Punjabi Jutti (Punjabi: ਪੰਜਾਬੀ ਜੁੱਤੀ) is a type of footwear common in North India and neighboring regions. They are traditionally made up of leather and with extensive embroidery, in real gold and silver thread as inspired by Indian royalty over 400 years ago. Prior to that, Rajputs of the northwest used to wear leather juttis. Now with changing times different juti with rubber soles are made available. Besides Punjabi jutti, there are various local styles as well. 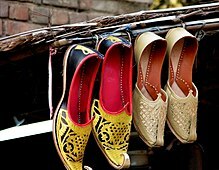 Today Amritsar and Patiala ("tilla jutti") are important trade centers for handcrafted juttis, from where they are exported all over the world to Punjabi diaspora. Closely related to mojaris. Juttis have evolved into several localized design variations, even depending upon the shoemaker. However by large, they have no left or right distinction, and over time take the shape of the foot. They usually have flat sole, and are similar in design for both women and men, except for men they have a sharp extended tip, nokh curved upwards like traditional mustaches, and are also called khussa, and some women’s juttis have no back part, near the ankle. Even with changing times juttis have remained part of ceremonial attire, especially at weddings, the unembellished juttis are used for everyday use for both men and women in most of Punjab mostly called Jalsa Jutti which is blackish in color. Punjabi jutti for men with extended curved tip, or nokh. They are usually made of fine leather and are delicately embroidered with threads or beads. Juttis are slip-on in style and are characterized by rising high to the Achilles' tendon in the back and covering the toes with a round or M-shaped heavily-embroidered upper shoe and leaving the top of the foot nearly bare. Some of them are handmade and have been embroidered beautifully. It is believed that one of the earliest examples of footwear worn on the Indian subcontinent is a sandal of wood, datable to circa 200 BC. During the 3rd and 4th Centuries in the Buddhist period, it was quite common to wear strapped sandals, and Indian kings wore sandals ornamented with precious jewels. Jain literature shows that leather was used for the making of shoes, which protected the toes from getting injured. Hides of cows, buffaloes, goats, sheep and other wild animals were used. These ethnic shoes were worn by wealthy zamindars, chaudhary, nawab, jagirdars Maharajas and Maharanis of India (esp. Punjab), various designs showcased in this category are inspired from the Mughal era. All these are handmade by skilled artisans in remote corners of India. Jutti is the traditional Indian footwear popular in North India, especially in Punjab, Haryana and Rajasthan. It also has slightly different variations which are known as kussa or mojri. Beauty, vibrant color and utility are combined in these juttis of India. Rich golden threads and colorful beads are used to craft exquisite motifs in order to impart a royal touch on these juttis made of different shades of leather. People prefer wearing them on traditional occasions like weddings. Along with traditional dresses like sherwani or kurta pajama, juttis form the quintessential accessory. ^ "Jutti sandals & shoes: buy them here - by Chappals.co.uk". chappals.co.uk. Retrieved 20 April 2018. ^ a b "Walking the path of common tradition". The Times of India. May 3, 2011. ^ "A glimpse into Punjabi culture". The Hindu. Feb 13, 2003. ^ "'The love and care we get in India is unparalleled'". The Times of India. May 2, 2011. ^ Jutta Jain-Neubauer; Bata Shoe Museum (2000). Feet & footwear in Indian culture. Mapin Publishing Pvt. Ltd. pp. 126, 175. ISBN 81-85822-69-7. ^ Feet and Footwear in Indian Culture, Jutta Hindu-Neubauer, Bata Shoe Museum Foundation, Toronto, Canada, in association with Mapin Publishing Pvt. Ltd., p.171. Wikimedia Commons has media related to Jutti. This page was last edited on 17 March 2019, at 17:57 (UTC).